Topics: light that does not pass. The shadow produced on another surface or screen when an object blocks a light source can be used to deduce information about the nature of the light source, the object blocking the light, the orientation between the light source and the blocking object, and the relative distance of the light source, the blocking object and the screen. For example, from the shape of the shadow produced by the people on the beach, it is apparent that people, or states, dummies or cardboard cutoffs that look like people are on the beach. Nothing else could have produced that shadow. The shape of the shadow of Earth during a lunar eclipse is one of the arguments that the Greeks long before Columbus to conclude that the Earth is round. More than two thousand years ago, Eratosthenes, a Greek who lived in Alexandria, used this principle to deduce the radius of the Earth to within a few percent. He knew that at noon on the summer solstice in the town of Syene the Sun was directly overhead and cast no shadow, whereas in Alexandria it did. 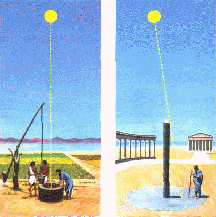 The difference can be explained if the Earth is round, and the radius of Earth can be computed from the length of the shadow cast by a pole of known length, and the distance between Alexandria and Syene. The nature of a shadow depends on the nature of the object and the light that it is blocking. For example, our shadow looks different in visible light as compared to X-ray light. Bone is denser than muscle tissue and skin, so it stops more of the X-rays. Fewer X-rays make it to the region of the film that's behind the bone, creating an X-ray shadow image. 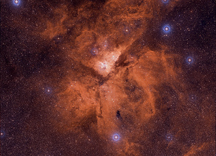 In a similar way, astronomers use distant X-ray sources as tools to "see inside" dark clouds and learn about the elements in those clouds. Seeing around corners - Diffraction. The wave-like nature of light affects the way that light casts shadow. For example, it allows light to bend around corners and cause a blur at the edge of the shadow. This effect, called diffraction, can produce unwanted effects, such as the so-called diffraction spikes seen in many optical astronomical images. These spikes are caused by the bending of light around the support structure for the secondary mirror in a reflecting telescope. Diffraction depends on the wavelength of light, with long wavelengths being diffracted more than short ones. This effect can be seen in "rainbow shadows," and has many practical applications, such as diffraction gratings used to study the structure of molecules, and holograms. One of the scientific instruments aboard Chandra uses diffraction gratings to produce rainbow shadows on X-rays. The intensity of each X-ray "color" or energy provides information on the X-ray spectrum of the source, such as the elements present in a hot gas cloud produced by a supernova explosion, or around a black hole.